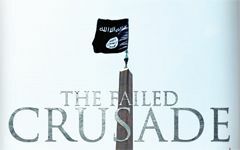 Issue #8 of the Islamic State's English magazine, Dabiq, has been released. 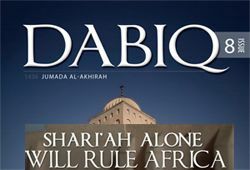 The cover title says "Shari'ah Alone Will Rule Africa." ISIS has released Issue 7 of Dabiq, its English magazine. You can read it here. Despite being a prisoner, I’ve been shown respect and kindness, which I haven’t seen from my own government. Even if I had the choice, could I honestly return to and live in a country that disowned the other Britons, all their families, and myself so contemptuously? ISIS has released the 4th issue of its Dabiq magazine, available here. It's more than 50 pages, and aside from the written statement by John Cantlie which I write about here, I think the three most interesting parts are the call for recruits to launch lone wolf attacks in their Western home countries and credit ISIS for any killings, an attempted justification for enslaving Yazidi women and turning them over as concubines to Islamic soldiers, and a letter it purports was written by deceased hostage Steven Sotloff to his mother. I'll summarize these in turn, and more briefly describe other topics addressed in the issue.